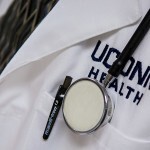 The UConn Health Department of Dermatology was originally established in 1980 as a Division of the Department of Medicine to meet the dermatologic health care needs of Connecticut citizens through education, service and research. An active clinical dermatology outpatient clinic and inpatient consultation service (John Dempsey Hospital). Specialty clinics including multidisciplinary melanoma and atypical nevi clinics, pediatric dermatology clinic, and podiatry clinic. Clinical trials for new medications, including medications for atopic dermatitis and psoriasis. An active Dermatopathology Laboratory that services the hospital and many private practitioners in the community. Clinico-pathological studies on melanocytic lesions, lymphoproliferative lesions, and causes of hair loss. The Gift that Keeps on Giving by Jane Grant-Kels, M.D. 1. The residents and medical students make us better. By asking us questions we need to stay abreast of the pathogenesis and therapy of the various diseases we treat. 2. We can never rest on our laurels. Every day we need to prove ourselves as teachers and dedicated clinicians. 3. They make us better role models. We can never become sloppy in our style or quality of medical care we deliver. 4. They keep us young. Surrounding ourselves with young fertile inquisitive minds keeps us on our toes and youthful. 5. They ask questions that often stimulate excellent and thought provoking research projects. 6.They have young eyes and on occasion will see something we may have overlooked. 7.They have a unique fresh perspective on our patients and on diseases they are learning about. We often therefore learn from them! 8. They are fun to be around because of their enthusiasm thus making every day more enjoyable and an exciting adventure for the entire staff. 9. Their enthusiasm for dermatology is contagious and reminds us daily why we chose this profession. 10. They will continue to care for patients long after we have stopped. And this is the ultimate gift to society that keeps on giving! Next time a resident comes in the exam room before the attending please welcome them as your future caregiver. They are the best and brightest of our society and have worked extremely hard to be standing there trying to give you the best care possible. Their only motivation is to help you and to learn. For the community, patients and providers. Read about upcoming events, new dermatology research, clinical tidbits and much more. For all rotating medical students (UConn and visiting) and rotating residents (UConn, visiting, or contracted), see the American Academy of Dermatology. You need to read and review information that is required prior and during your rotation. For more information, contact Christina Iwanik at 860-679-6759.